For a long time, owners of Mercedes-Benz Type 220S (W180) Pontons were frustrated in identifying a correctly sized, reasonably priced replacement dry air filter element. Mercedes stopped supplying these filters for a long time but resumed supplying them at the eye-popping list price of $185.00. Much trial and error and plenty of wheel spinning has taken place individually trying to determine the best substitute. Popularly available after-market filters required compromises and sometimes padding in the housing to ensure no raw air reached the carburetors. Satisfaction was lacking. There is good news and bad news to report. The good news: "Auf Wiedersehen" to the Great Air Filter Quest. Suitable solutions exist. The bad news: suitable after-market solutions existed all along. The vexation was unnecessary. Mercedes is again supplying the air filter element for the 220S Pontons. Its part number is: 000-094-36-06. The filter with original round cardboard cover piece over the inside cavity is now supplied with a metal cover over the whole filter. It lists at $74.00 in the United States and EUR57.52 in Germany. Although not cheap, this is much improved over the former price. Mahle currently makes this filter in Germany for Mercedes-Benz as an OEM spare part. Mahle does not, however, provide this filter to the after-market, so it carries no after-market designation. The official dimensions of the filter were not available from either Mercedes or Mahle. The "new" MB filter will not fit in the air cleaner WITH the (smaller) rubber (seal/ring). Maybe the "old" or original filter required this to seal the bottom edge (and maybe that is why Mercedes still makes it). 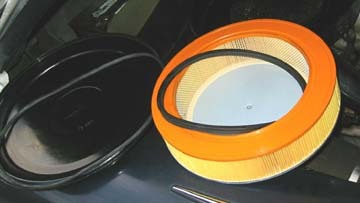 The "new" MB filter has an orange rubber ring around the bottom edge of the metal ring around the mesh. The metal top is just exactly the size of the indentation of the air cleaner lid. I would conclude that one needs the larger rubber seal 000-094-14-79 but not the inside ring/seal 000-094-15-79 when using the new MB filter 000-094-36-06. Neither of these filters is still made by the respective manufacturer, and they are gone from the manufacturer's data bases. 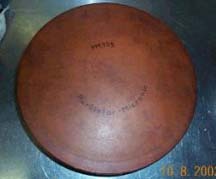 Purolator (www.pureoil.com) states that the PM155 was originally manufactured in Europe for Purolator Europe and was never marketed in the United States, but Purolator Europe no longer exists. Purolator further advises that there is no current equivalent to the PM155 and that its official dimensions are no longer on record. I initially prepared a comprehensive table including many of the common filters that 220S Ponton owners used with only partially satisfactory results. That table also contained the original filters and better current substitutes I unearthed. It became unwieldy. In light of my findings, therefore, I decided to relegate the imperfect substitutes to an annex at the end of this article. Manufacturer Designation Height Inside Dia. (without seal) Inside Dia. (with seal) Outside Dia. Note: The above measurements for the current Mercedes filter serve as the point of departure for determining suitable filters in the after-market. Note further that the Mann and Purolator period filters have no valid current cross reference, although the Purolator PM155 has "crossed" indirectly to a grossly different air filter of another brand, to a WIX oil filter, and to some lubrication devices. The Hastings website (www.hastingsfilters.com) produced crosses from the PM155 to an AF designation that was way off. I conclude that cross reference tables are unreliable, indeed chaotic. Check and recheck. Do it again! So, the question is what to do if one does not want to spend $60.00 plus for the Mercedes filter element that is hidden from view in the filter housing. For the longest time, the search in the popular market inevitably led to compromises as well as lengthy, inconclusive discussions in interest groups, so individually we kept on looking. Now, however: Diogenese! Extinguish thy lamp! Hastings (1-800-887-8836) said that their technical data reference indicates that the identical Hastings AF292, Amsoil AF292, and Baldwin PA2015, listed in the above table, have a Mercedes application: Mercedes number 943-606. The Hastings website also crosses from this truncated Mercedes number. This is not a typical Mercedes number. Nevertheless: ILLUMINATION! Recall the current Mercedes number: 000-094-36-06. The Hastings data base apparently does not recognize preceding zeros in arriving at: 943-606. A match turned up: same numbers, differently stated. Finally, a stated cross reference to a current after-market air filter. The Hastings-made filters lack the metal cover. Another "cross reference" also came up, sort of. Fleetguard (1-800-223-4583) states that their AF483 technical discussion mentions Mercedes 000-094-36-06 but at the same time curiously does not identify that number as a specific cross reference. The Fleetguard filter does not have the metal cover, so perhaps this explains the lack of the specific cross reference indication. Champ (1-800-882-0890) makes filters under its own name and the Luberfiner and Warner brand names. These filters, all identical in dimensions, have no cover. There is no mention of Mercedes in the Champ technical literature pertaining to these filters. The after-market solution has been present all along. One simply needed to look beyond the well-known brands commonly sold in the popular outlets. The Hastings-made filters, the Champ family of filters, the STP filter, and the Fleetguard filter-all of these appear, by virtue of their dimensions, to be perfect fits when compared with the current Mercedes/Mahle offering. At this point we need to examine whether these after-market filters are truly adequate substitutes for the current Mercedes filter. The table above shows that the Mercedes filter, with cover, has virtually the same height as five of the filters. The height difference with the remaining three is insignificant, (.065 inch or 1/16 inch). 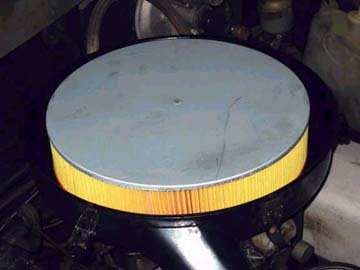 As for outside diameter, the Mercedes filter is about 0.123-0.124 inches or almost 1/8 inch wider. This difference too is quite minor. The metal cover on the Mercedes filter is apparently thin gage. In addition, the vagaries of measuring may well explain these minor differences. 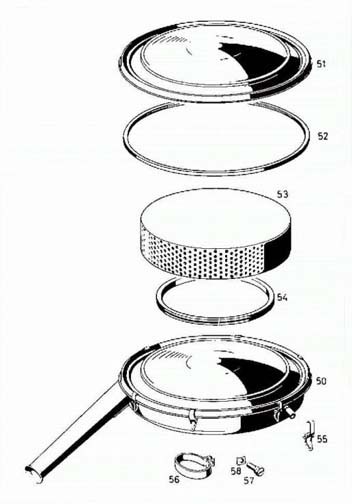 Note that the dimensions of the Mercedes filter were done by hand while the measurements of the other filters came officially from the manufacturers. Note further that the current Mercedes filter's dimensions are slightly greater than those for the period Mann and Purolator filters whose dimensions were also taken by hand. None of the after-market filters comes with the metal cover found on the Mercedes/Mahle filter. 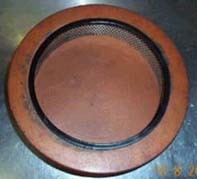 This metal cover is round, slightly larger than the outside diameter of the filter element, bent over to form a small lip, and glued to the filter top. If you absolutely, positively cannot make do without the metal cover, one could be fashioned with light metal, tin snips, and adhesive. You could also, most likely, be able to transfer the metal cover from the Mercedes filter, or one made up, to a subsequent replacement. Maybe thick tinfoil would work. I installed the Hastings AF292 in my 220S. It fit perfectly. Note, however, that to have it fit perfectly I had to eliminate the smaller rubber ring at the bottom of the housing around the mesh. The new Mercedes air filter also requires dispensing with this ring. Therefore, spare yourself the expense of getting rubber ring Mercedes number 000-094-15-79. Seek and ye shall find! The internet is a wonderful tool. Approach cross reference tables with considerable skepticism. Do not necessarily accept their information at face value. Disclaimer: The above information is not to be considered authoritative. It is provided as a courtesy only. One should verify a filter's appropriateness before installing it. Acknowledgments: Special thanks are owed to Christopher Craig who supplied the information about, and picture of, the current Mercedes filter and the two rubber rings. Jack Kotrba kindly provided the picture of the Purolator period filter as well as its measurements and the measurements of the K & N filter which K & N confirmed. 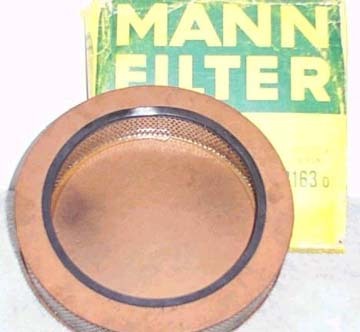 Len Sokoloff provided the same about the period Mann filter. John Enright of the Hengst filter people (reached through www.colorfil.com) helpfully provided the information about the Champ group, pointed me towards the Fleetguard filter, and did some research among his European sources. This table lists many of the air filters that 220S Ponton owners tried with less-than-perfect success, and often as imperfect compromises. Usually some sort of additional sealing was needed to close gaps. No mass-marketed after-market filter application for the 220S Ponton has come to my attention, with one erroneous exception. Purolator's website (www.pureoil.com) declares the following air filter for the 220S Ponton: A31631. Discussion with Purolator (1-800-526-4250) reveals that this is a mistake. This filter's dimensions suggest it may be for the 220SE Ponton and, perhaps, some Finbacks. It is much differently sized from the 220S (W180) air filter. Further discussion with Purolator reveals that their A41133 air filter is the closest they have to the dimensions of the original Mann C3163 and Purolator PM155 filters and the current Mercedes filter. That is what I have been using to date, but I shall now change. Some owners and restorers settled on WIX 42097, above, as the best current after-market alternative. WIX (1-800-949-6698) (www.wixfilters.com) states that they have no current cross to the original Mann and Purolator filters or to the current Mercedes filter. Neither does Beck Arnley (1-800-342-5972) have any current cross references. Hengst also reports that they currently make no air filter in the size for the 220S Ponton. 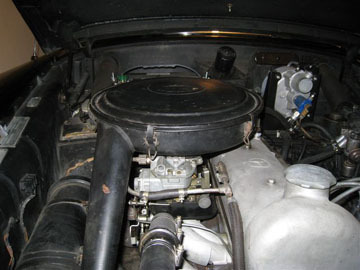 Peter Snihur of New York successfully used a Napa # 2044 (or Fram # CA305) air filter in his Type 220S Ponton cabriolet. At the outset we need to note that the air filter element for the 220SE Ponton is much differently shaped. Several widely marketed after-market filter elements are apparently available to fit the 220SE, presumably because they happen to fit a number of other, later cars including (but not limited to) Mercedes. Some of the after-market cross references one finds confuse the 220S and 220SE cars and thus mislead. Other authors need to address the more favorable 220SE air filter situation and the requirements of other Pontons. But is vexation not one of the joys of Ponton ownership? The Mercedes part number found on the Ponton 220S filter housing cover (DB 001-094-15-02) is apparently defunct. Nowhere in databases does it come up. The housing also indicates Knecht LP-404. Again, I could find no reference to this in any data base. This suggests that Mercedes-Benz dealers in the United States pay just over $50 including international shipping, customs, and the MBUSA markup. Dimensions in inches. For metric conversion: 1 inch = 2.54 centimeters. Formerly Deutsch, made by Champ, now sold to STP. To complete the circle of confusion, Champ makes STP air filters under contract. If you find a Deutsch air filter AF114 collecting dust on a shelf somewhere, it should fit. Additional confusion arises from the fact that several marketing names of air filters use the AF designation followed by a number. So, if you find some brand name with the AF designation, understand that the AF numbers can, and do, mean differently sized filters from one name to another. Confusing? Certainly. Apparently Hastings produces several lines of air filters, only one of which is marketed under the company's own name. Baldwin is one of these lines. Hastings makes Amsoil air filters under contract. Hastings said this filter is indicated for a late 1960s Toyota Crown. Hastings crosses its AF292 to Toyota air filter part number 17801-41010. A nearby Toyota dealer had two in stock at $7.90. This filter’s measurements revealed an exact fit for our 220S purposes: H 2.5 in., ID 8.75 in., OD 12 in. 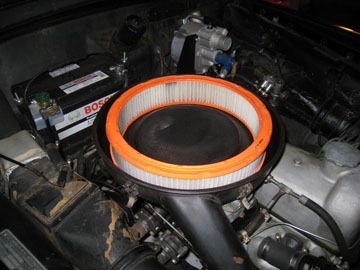 A reader of this page who owns a Type 220S sedan (Alan Fisher), wrote that after reading this article and not easily finding a Hastings or Baldwin air filter, he did a trial-and-error effort at a local Pep Boys automotive store. He discovered that Purolator air filter PA40113 fits. The author, Doug Broome, tried this Purolator model in his 220S filter housing, and verified that it does suffice, but is not as neat and complete a fit as the Hastings and Baldwin filters. Still, it is much more widely available than the Hastings or Baldwin filters.